Delivered over two weekends, the RCA Coach workshops provide an exceptional foundation for your coaching career and introduces new coaching methods that will enhance your programs effectiveness. There is a lot to learn — therefore this workshop offers you a mix of classroom and hands on experiences delivered over two weekends. Make Ethical Decisions, a must-have skill for every coach and an NCCP requirement for all sports. A unique aspect of this workshop is the movement screen process that focuses on eight movement tests for athlete assessment. This process allows the coach to ensure that sport activities are based on the new rowers strengths and weaknesses, enhancing their ability to improve and avoid injury. This engaging and interactive element of the workshop is a fantastic learning exercise for any coach, and is applicable to many other sports. After six months of coaching, you may participate in the second weekend of this workshop. Between sessions, you will work on a practical assignment that will encourage you to apply skills learned during the first weekend within your rowing program. Practical analysis of the coach’s program using the completed assignment to ensure real life application. Anyone with experience rowing at the high school, club, or university level with basic rowing technical knowledge and who wants to coach rowers in their first year or two of competition. The rowers that you would coach are in the Train to Train or early Learn to Compete stages of LTAD. 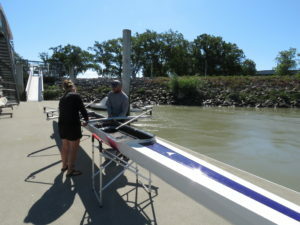 They have taken a Learn to Row course and still require considerable emphasis on developing good technique. Rowing programs could include; high school, university, club, or masters. Sport backgrounds will vary but these rowers are novices and are just beginning to compete.